Just days after the history-making Rock the Vote concert and presidential debate watch party in Downtown Boca, the second annual “Meet Me On The Promenade” event takes center stage as “the next big thing.” The free two-night, one-day street fest featuring the downtown destination’s best is held from Friday, October 26th from 6:00 p.m. to 10:00 p.m. and Saturday, October 27th from 10:00 a.m. to 10:00 p.m. with Sanborn Square serving as the event hub (71 North Federal Highway). On-going activities are scheduled along the Promenade and the areas that it connects such as Palmetto Park Road, N.E. First Avenue, Boca Raton Road, Mizner Park and more. The fest that drew 14,000 last year returns…now even more stroll-able, bike-able, shop-able, and dine-able with continuous live entertainment, plenty of “friends & family” fun, and staged “Fall For Downtown Boca” keepsake photo opportunities both inside a gigantic “walk in” commemorative globe and next to the Office Depot Tony Stewart NASCAR show car. There will be Family and Sports Zones, themed villages, a Doggie Depot, classic and antique car showcases, an artists and crafters expo, and more. Saturday afternoon and evening features a memorable schedule of Halloween Happenings! including a costume contest for children and families, a pet costume showcase, shop-to-shop “trick or treating”, early family dining specials and “Happy Halloween Hours”, BeetleJuice’s Rock ‘N Roll Monster Revue and “after parties” at participating Downtown Boca pubs and clubs. While there will be plenty of free event parking available, avid cyclists are encouraged to “bike it” and head to the VIB (Very Important Bicyclist) Parking, complete with safety seminars and bike check-ups, sponsored and hosted at Comerica Bank (1 South Federal Highway, corner of South Federal Highway and East Palmetto Park Road) on Saturday from 10:00 a.m. to 6:00 p.m. Complimentary “jump on, jump off” trolley service throughout the festival will run Friday from 5:00 p.m. to 11:00 p.m. and on Saturday from 10:00 a.m. to 11:00 p.m. The free, open-to-the-public opening festivities at Sanborn Square will feature live entertainment headlined by Amber Leigh, South Florida’s “Female Artist of the Year”. Opening for Amber will be the debut of Glee-style performances by the nationally competitive Olympic Heights Community High School 2013 Show Choir and the Hip Hop Kidz following the official event kick-off ceremonies by the Mayor, City Council and Lynn University cheerleaders. The Sports Zone sponsored by Allianz Championship will include an inflatable driving range, an 88-foot street hockey rink by the Florida Panthers; parents and children will enjoy an inflatable family playground sponsored by Lesser, Lesser, Landy & Smith at the Family Zone and more. Festivities include the debut of branded beverage stations serving three signature cocktails, Boca Downtowner PINK (pink-tini), RED (red-tini) and BLUE (blue-tini) to benefit the American Cancer Society, Office Depot Foundation, and Junior League of Boca Raton as part of Cocktails-4-Charity sponsored by Downtown Boca with mixology by Potions in Motion. Additional Friday night features include gourmet truck “curbside food courts”, early dining and happy hour specials by participating restaurants, extended hours at shops and dining venues and ‘after parties’ held at participating Downtown Boca pubs and clubs and more. Saturday morning starts early with the American Cancer Society’s (ACS) 11th Annual Making Strides Against Breast Cancer Walk that begins at the Mizner Park Amphitheater with registration at 7:30 a.m. and routes walkers along Palmetto Park Road to A1A and back. Meet Me On The Promenade programming immediately follows the ACS walk, with mid-afternoon excitement of a Halloween Happenings! festivities running into the night with “after parties” at participating area clubs and pubs. Through a fun “Stroll, Shop & Savor” self-tour, event-goers will get plenty of opportunity to explore and enjoy the eclectic live-work-play-stay features of Boca’s new generation Downtown for all generations via event programming designed for navigating easily through Downtown Boca’s community assets: dining, shopping, fashion, culture, family fun, pet-friendly living and nightlife as well as all the Meet Me On The Promenade scheduled activities and programming, entertainment, retail and dining discounts and giveaway offerings, showcasing all there is to see and do along the Promenade and the areas that it connects. There will be ongoing live entertainment across three event stages; memory-making commemorative globe photo stops; Family Zone sponsored by Office Depot Foundation with inflatable playground, Office Depot NASCAR show car, interactive programming and children’s activities; Sports Zone sponsored by Allianz Championship with inflatable driving range, interactive play, basketball hoop, mascot appearances and giveaways; Classic & Antique Car Showcases featuring award-winning rides such as a 1959 Cadillac convertible and Ford Thunderbird; pet-lovers Doggie Depot hosted by mod.dog grooming salon and boutique; Artists and Crafters Village; debut of 34-foot pirate ship and “A Day in the Life of a Pirate” show (admission applies); Community Corner nonprofit showcase; Health-Full Community; Chamber Village; Gourmet Truck Expo “curbside food courts”; sponsored beverage stations featuring the debut of official Boca Downtowner signature cocktails benefiting nonprofits; Green Market; and, beginning at 3:00 p.m. on Saturday, “Halloween Happenings”. The family-friendly Halloween Happenings throughout the Promenade locale will include a children’s and family costume contest at the Family Zone, pet costume show at Stage 2 (registration required at Doggie Depot), shop-to-shop “trick-or-treating” at participating restaurants and retailers displaying the special event decal in its window, early dining and “Happy Halloween Hour” specials at participating restaurants and BeetleJuice’s Rock & Roll Monster Revue on the main entertainment stage in Sanborn Square. “Meet Me On The Promenade returns as the perfect example of successful public/private partnership engagement as is hosted by the Boca Raton Community Redevelopment Agency (CRA); developed and implemented by the City’s branding and marketing consultants; produced by City staff; supported by the connectivity, participation and collaboration of Downtown Boca businesses and completely underwritten by community stakeholders and partners who understand the important impact a vibrant Downtown community has on lifestyle and economic benefits for an entire community and destination,” said Scott. She added that more than 14,000 event-goers filled the streets of the Promenade during the inaugural event, driving new business to the participating retailers, salons, spas, boutiques, restaurants, galleries and more. 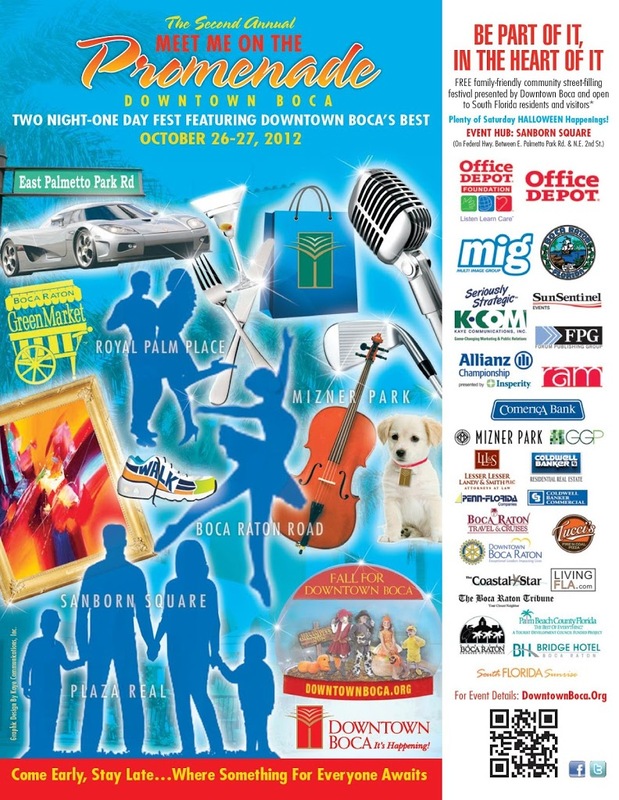 Meet Me On The Promenade Sponsors include: Office Depot Foundation; Multi Image Group; the City of Boca Raton; Sun-Sentinel Events; Forum Publishing Group; Kaye Communications, Inc.; Mizner Park/General Growth Properties; Allianz Championship; RAM; Comerica Bank; Coldwell Banker; Lesser, Lesser, Landy & Smith, PLLC; Penn-Florida; Boca Raton Travel & Cruises; Tucci’s Pizza; and the Rotary Club Downtown Boca Raton. Programming and Community Partners to date include: AVR Depot; Art Attack! ; Potions In Motion; Gourmet Truck Expo; the American Cancer Society; Florida Panthers; Miami Dolphins; Boca Raton Children’s Museum; several public and private schools including Olympic Heights High School, Grandview Preparatory School, FAU Charles E. Schmidt College of Medicine; Spirit of Giving Network; Junior League of Boca Raton; Boca Raton Museum of Art; Boca Raton Historical Society; Greater Boca Raton Chamber of Commerce; Palm Beach County Convention & Visitors Bureau; Penn-Florida; mod.dog Grooming Salon & Boutique; Sol Children Theatre Troupe; Dancing Classrooms; Hip Hop Kidz; Showtime Performing Arts Theatre; Lynn University; Boca Raton Greenmarket; YMCA of South Palm Beach County; Linda Alfieri Salon; W.A.T.C.H. Foundation; Fred Astaire Dance Studio Boca Raton; Sunflower Creative Arts; Community Blood Centers of Florida, Inc.; Dubliner; The Funky Biscuit; Platforms Dance Club; Biergarten Boca Raton; nonprofit organizations; and media including South Florida Parenting, Boca Raton Forum, West Boca Forum, Coral Springs Forum, Delray Forum, City Link, Boca Piquant, Boca Raton Tribune; The Coastal Star; South Florida Sunrise, LivingFLA.com; and more. 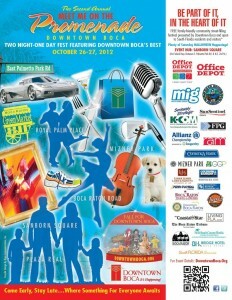 For updates on Meet Me On The Promenade and other Downtown Boca events, visit DowntownBoca.org often, become of a Facebook fan at www.facebook.com/DowntownBoca or call 561-367-7070.